It's 物語 monogatari (fairy tale) time! Once upon a time, there lived an old man and an old woman. The old man was kind and gentle, but his wife was mean and greedy. One morning as usual, the old man left for work in the mountains where he cut wood, plowed the earth, and worked in the field. This morning, he went deep into the mountains to cut firewood. While he was working, he heard the voice of a sparrow crying. When he looked down, he saw an injured young sparrow trapped under a dead branch. "Oh, you poor thing," the old man said as he gently picked up the sparrow. "Don't worry. I'll take care of you. You'll be fine in no time. Let's go to my house," he said. When they arrived, the old man bandaged the sparrow and fed it some rice grains. The old woman didn't like this at all and got angry. "Why are you wasting our precious rice on that bird?" she exclaimed. But the old man paid her no mind and worked hard to nurse the young sparrow back to health. One day, as the old man went back to work in the mountains, he asked the old woman, "Take care of the sparrow, please." "Yes, yes, I know," the old woman snapped, but she didn't care about the bird and had no intention of feeding it. She left the sparrow at home and went to the river to do the wash. While it was left all alone, the little sparrow got hungry. It found a bowl of starch that the old woman had made. Because the sparrow was so hungry, it began to nibble at the starch without thinking and ate it all up. Then the old woman returned from the river, ready to starch the linens. She noticed that the starch was missing and asked the sparrow what had happened. "I'm so sorry," the sparrow said. "I was hungry and couldn't help eating it." The old woman flew into a rage. "You thief!" she thundered. "I'll fix you so you'll never be able to do anything like that again," she said, and she cut the little sparrow's tongue with a pair of scissors. The poor little sparrow flew back into the mountains, crying the whole way. When the old man returned from the mountains, he noticed that the sparrow was gone. "What happened to the little sparrow?" he asked the old woman. "That bird ate my starch," she replied, "so I cut its tongue and chased it away." The old man was stunned. "Oh, forgive me little sparrow. It must have hurt so much," he said with tears streaming down his face. The old man then went back into the mountains to search for the sparrow. The old man went here and there in the forest, calling out "Little sparrow, come back!" but the sparrow was nowhere to be found. "That's right," the old man thought to himself, "I've heard that the sparrows have an inn. If I go there, I can find him." As he was walking further into the mountains, three sparrows appeared before him. "Oh, sparrows. Where is your inn?" he asked them. "This way, this way, chirp, chirp," the sparrows said, and they led the man through a bamboo grove even further into the mountains. Suddenly, in front of him was a splendid mansion with many sparrows lined up in front of the gate. "Welcome," one of them said, "We've been expecting you." "Have you seen my little sparrow?" the old man asked. "He's waiting for you inside," the sparrow answered and led the old man into a parlor in the back of the mansion. When he entered the room, the little sparrow came running up to greet him. "Oh, you poor dear. Are you okay? I was so worried," the man said, delighted to see the little sparrow again. The sparrows brought out trays of delicious food for the old man and began to sing and dance for him. After the old man had quite enjoyed himself, he got up and said to the sparrows, "I wish I could stay, but I must be getting home. My wife will be worried." With this, the sparrows brought out two wicker baskets, a big one and a small one. "As a gift, take whichever one you like," one of the sparrows said. Although he had no desire for a gift, he accepted the small basket. "I'm sorry. I'm old, so I guess I'd better take the small one," he said, and he made his way home. When the old man reached home, he called out to the old woman, "I'm home. I met the little sparrow. I even got a gift. I wonder what's inside." The two of them opened the basket, and to their surprise, the basket was filled with gold, silver, fine cloth, and other valuables. "So that's why it was so heavy," the old man said. "It's a good thing I took the small basket." "What? There was a big one?" the old woman shrieked. "The big one must have even more valuables! Okay, I'll go and get the big basket," and no sooner had she said those words, than she was out the door and running to the mountains, overtaken by greed. When the old woman reached the sparrows' inn, she called out to the little sparrow. "Little sparrow! Little sparrow! I'm here," she said with a forced smile, and the little sparrow came out to see her. "Little sparrow," the woman began, "I took care of you didn't I? I'm not hungry, so just hurry up and bring out the baskets." The sparrows were disappointed, but brought out two baskets anyway. "Choose whichever one you like," they said. The old woman did not hesitate, "I'll take the big one. I'm strong enough to carry it." As she was on her way out, one of the sparrows said to her, "Don't open the basket until you get home," but she paid it no mind and ran home as fast as she could. On the way back, however, the woman could no longer contain her greed. She desperately wanted to see her valuables, so she stopped and opened the basket. When she did, smoke came out along with one-eyed goblins, giant snakes, and other monsters. The old woman was so shocked that she threw the basket down and tried to run away. In her haste, she slipped and fell, rolling all the way down the mountain. If somebody really read through both versions, you will notice a lot of differences, like the sparrow being found in the woods, rather than in the lunch-box. Also the ordeals on the journey to search for the sparrow were completely left out. I think it is because both appear strange to western people. 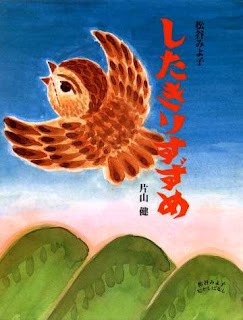 (In the Japanese version, the old guy had to continuously drink the cleaning water of an ox-cleaner, a horse-cleaner and a vegetable-cleaner, before they told him were to find the sparrow). For the similarity to Frau Holle, in both fairy tales the same way leads to gold/fortune and ugly things/disaster. In both stories one good minded human goes the way and finds the first one, when afterwards a selfish minded human goes the same way with different behavior and morals and thus ends up with the exact opposite of the first one. These core similarity between Frau Holle and 舌切り雀 is really striking.